Some books are just meant to be used. I am talking about really used . . . not just read . . . but really used. Awakening the Creative Spirit: Bringing the Arts to Spiritual Direction (Morehouse Publishing, 2010) by Christine Valters Painter and Betsey Beckman is one of those books. I snared it up as soon as it arrived and I have only grudgingly parted with it ever since. As a former art teacher and on-going member of a spiritual journey group called Creative Call, it is not only perfect for me but for all my fellow spiritual travelers as well. The authors, both spiritual directors with impressive histories, begin by providing personal narratives for how the arts have informed their work in spiritual direction. Christine has a PhD in Christian Spirituality and has explored a wide range of arts. Becky’s focus has been in dance. As they move on to specific art disciplines, they provide suggestions and exercises intended to take advantage of the unique spiritual perspectives of the individual art forms. Each artistic discipline is rich with ideas that can be used in either group or individual settings. And if that isn’t enough to stir your soul, there are chapters devoted to specific spiritual needs such as periods of grieving, transition, or the cycles of life. Complete with photos of finished artwork & comments from program participants who have gained insight from the exercises, Awakening the Creative Spirit provides a wealth of tools for any faith-based creativity-enhanced program. An extensive bibliography can direct your study beyond its pages as you dig even deeper. No matter whether your gifts lie in creative movement, poetry, music or visual arts, I predict that you will find this wonderfully ‘useful’ book one that you simply can’t part with either. Enjoy the journey! 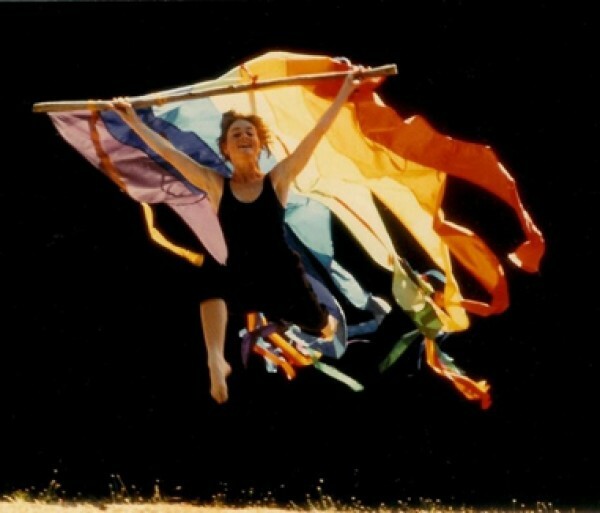 The photo is of co-author Betsey Beckman of The Dancing Word (Embodying the Sacred in Liturgy and Life).